We would love to have your feedback and see your pictures! Send us your thoughts here or use the form at the bottom of the page. "I own three B&G Martin beds and every one of my dogs absolutely adores them. I have an old hound dog with arthritis who got the firmer insert and she spends almost the entire day on her bed looking blissfully comfortable. The height and firmness also make it easy for her to get up when she needs to (I've bought other beds that have been too soft and she has avoided them altogether). My little Westie also has a B&G Martin bed and he loves it, it's the perfect size and he even prefers it to sleeping on the couch now (that's the ultimate compliment!). Last but not least my 4-lb Yorkie has the smallest size which is quite literally her throne. She loves sleeping on all three of the dog beds actually, just to show everyone who's boss. I can't recommend this brand highly enough - the ease of washing and changing the sheets (sometimes daily), the beautiful textiles, and most importantly the comfort for the dogs make these beds a no-brainer and a totally worthwhile investment." "I purchased the Foam & Faux Down cushion to support Foxy's old bones. She's an older dog and used to wake up multiple times at night, switching positions, and finally she would sleep on the carpet. As she's gotten older, she can't jump on the couch anymore. She loves her new bed and sleeps through the night now! Thank you B&G Martin!" "B & G Martin is an outstanding company with the best dog beds I've ever seen. 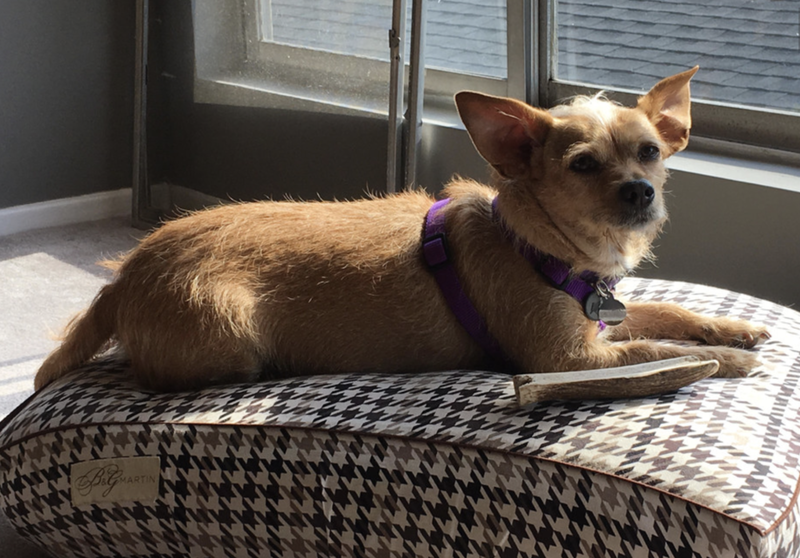 My dog absolutely loves her B & G Martin bed and so do I. I love that the beds are made from very high quality materials and are designed to last for a very long time. I love that there are designer linens available in beautiful high quality fabric. I love that you can customize a bed with a fabric of your choosing if you want to. I love that there are gorgeous bed bases that add high design and style to any room. And, I love that this company is focused, not only on high quality products, but in reducing dog overpopulation and contributing to the well being of dogs worldwide. Any company that has such outstanding products and couples it with humanitarian efforts is #1 in my book. The integrity of B & G Martin is clear in this statement from their website: "We created this company to enable us to sustainably fund dog rescue efforts while also providing a superior, design oriented product to pet owners and their dogs." So, I will be continuing to shop and recommend B & G Martin to everyone I know with a pet. They get 5 stars from me! Very Happy B & G Martin customer." "My Lily loves her new bed! Amazing quality and super plush. She has another bed we had before this purchase and she definitely prefers this one. It's time for the old bed to go! LOL! She's so spoiled! I'm ordering the fitted linens - Frette, of course!" E-mail us your review using this form! We are looking forward to hearing from you.